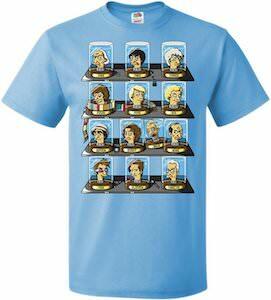 Now there is a the heads of 13 Doctor’s t-shirt that will bring you lots of Doctor Who heads on one amazing shirt. 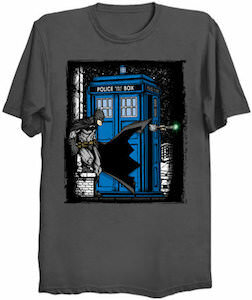 This Doctor Who t-shirt is available in a bunch of fun colors and is unisex so that both men and women can enjoy it and as it comes in sizes Small – 6XL there is likely one that fits you perfectly. On the t-shirt you can see 4 shelves and on these shelves you can find displays with in them the heads of the first 13 Doctor Who’s, all the Doctors from before the first female Doctor Who and yes that includes the war doctor. Besides the heads there are some other items to like 3D glasses, bow tie, scarfs, and more. If you are a Doctor Who fan that also likes Star Wars then you have to check out this are you my mummy t-shirt. 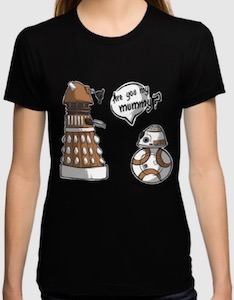 On this Doctor Who t-shirt you can see a Dalek and next to it you find BB-8 and the droid is saying “Are You My Mummy” which does bring back memories to the famous episode with the gas masks. 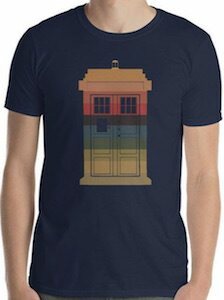 You can get this special Doctor Who shirt in styles for men and women and it is available in a wide range of sizes and colors. The mix of Star Wars and Doctor Who makes for something fun so if you want a fun shirt you have to check this out. 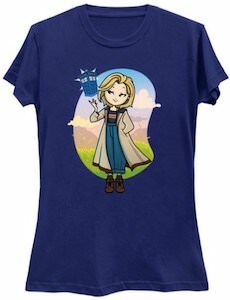 If you like to look more like the first female Doctor Who then you should check out this 13th Doctor Who outfit t-shirt. 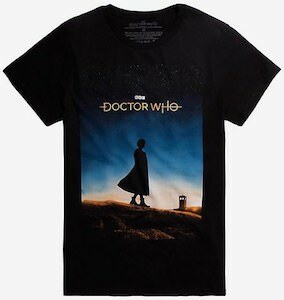 The t-shirt looks almost exactly what the 13th Doctor is wearing and that means that you can use this as a cosplay or Halloween costume part. The t-shirt has a the perfect neckline and shows a bunch of colorful lines on the top and that make this just a fun shirt to wear anyway of the year or as part of a costume. 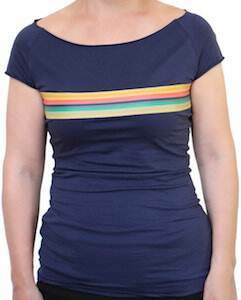 This Doctor Who t-shirt is made from 100% cotton and comes in women’s sizes Small – XL. Come see a female Doctor and a sunset t-shirt. On the t-shirt you can see the 13th Doctor Who and even the Tardis. You can not see the details of the Doctor and the Tardis as the sun is setting but you can see a silhouette of her standing on a hillside while looking on the world below her. 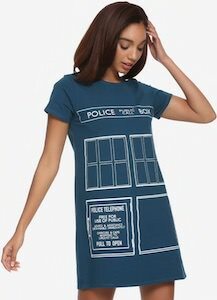 You can get this Doctor Who t-shirt in men’s sizes XSmall – 3XL and they are all made from 100% cotton and will look great on women too. 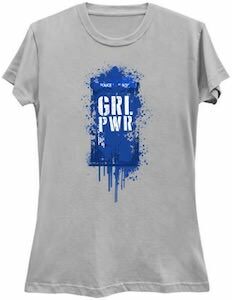 And with the first female Doctor Who also a new Doctor Who logo arrived and you can find that on this special t-shirt too. 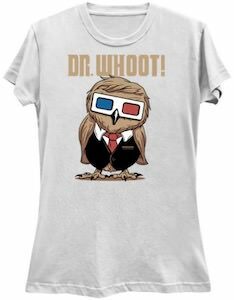 If you like Doctor Who and owls then you have to check out this Dr. Whoot t-shirt. The shirt is available in styles for men and women and comes in sizes Small – 6XL and is made from 100% cotton. On this Doctor Who t-shirt you won’t see a real Doctor but an owl that looks like the 10th Doctor complete with a nice tie and his two color 3D glasses. Above the owl it says “Dr. Whoot!” because it is Doctor Who but also an owl. It is a fun t-shirt for all the Doctor Who fans that like to have a t-shirt that is just a bit different.